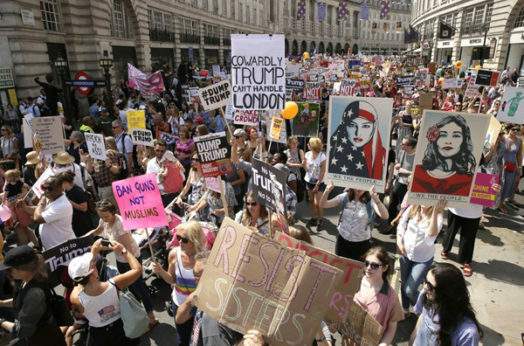 LONDON—Tens of thousands of protesters have gathered across Britain against the highly controversial visit of President Donald Trump, with a mass demonstration and rally underway in the capital today. Campaigners hit out today against secret trade talks between Trump and the government of Prime Minister Theresa May which could leave the country’s public health care system—the National Health Service—in tatters. Britain’s International Trade Secretary Liam Fox confirmed yesterday that U.S.-U.K. trade talks had taken place early in the week. Fox was one of the people who greeted Trump and his wife Melania when they arrived at Stansted airport yesterday afternoon. Nick Dearden, director of the activist group Global Justice Now, said that one of the reasons for Trump’s visit is to continue talks for a trade deal that would cause damage to public services in Britain. He said, “Trump’s visit to Britain is about pulling the U.K. closer to Trump, including laying the ground for a TTIP-style trade deal with the U.S. which would threaten our NHS, financial regulations, and food standards. “When Prime Minister Theresa May invited Trump on a visit, she clearly wanted to create a much deeper relationship with the U.S.—one that would cement deregulation, liberalization, and privatization into the British economy for decades to come. “Just in the last week the government has had more secret talks with the U.S., and they will talk trade this coming weekend. These talks happen with no accountability to the British public or even parliament. Dearden has said the debate on the Trade Bill, which MPs will vote on next Tuesday, must be used to give control over trade policy to Parliament and the people. The pomp-filled welcome to Britain given to him by May was overshadowed Friday not just by protests, but also by an explosive interview in which the president blasted Prime Minister Theresa May for seeking a “weak Brexit,” blamed London’s mayor Sadiq Khan for terror attacks against the city, and argued that Europe was “losing its culture” because of immigration. 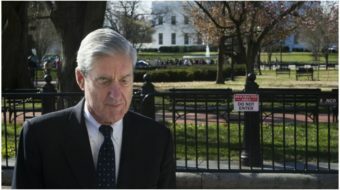 The interview was with the tabloid newspaper The Sun, which belongs to Rupert Murdoch’s News Corporation, owner of Fox News in the U.S.
Alongside his barely veiled racist comments concerning immigration in Europe, Trump also endorsed Boris Johnson, May’s recently-resigned Foreign Secretary, to be Prime Minister of the U.K. Johnson is known for his own anti-immigrant and right-wing policies. Labour Party leader Jeremy Corbyn, meanwhile, spoke out against Trump’s immigration policies back in the U.S., which have torn families apart at the Mexican border and have led to children being put in cages. 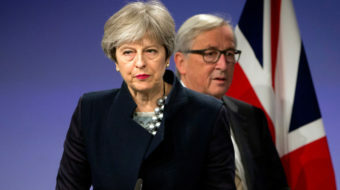 He said, “Theresa May has invited President Trump to our country at a time when his dangerous and inhumane policies are putting the lives and wellbeing of millions of people at risk. “We are committed to dialogue, including of course with those we strongly disagree with, and in government we would find a way to work with his administration while also standing up for our values. 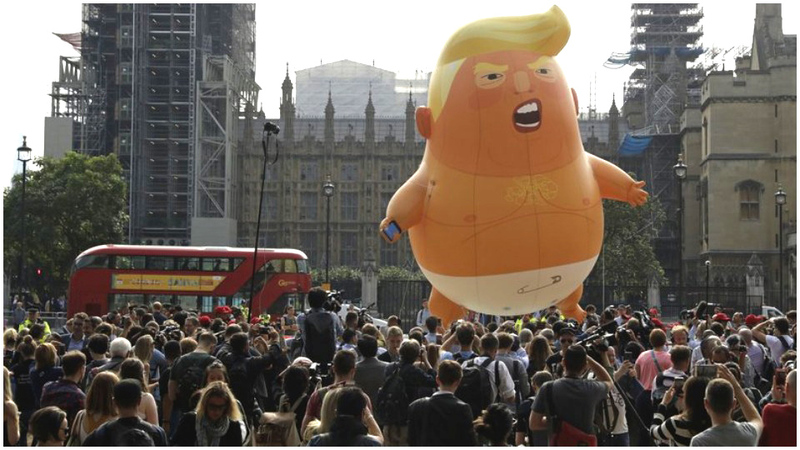 Trump’s visit to Britain follows his two-day NATO summit, in which the president attacked and chastised member nations for not spending 2 percent of their GDP on their militaries. He accused Germany—which spends 1.2 per cent of its GDP on defense—of being “totally controlled by Russia” for agreeing to a new oil and gas pipeline with the country. Campaign Against Arms Trade spokesman Andrew Smith warned that the “only ones who will benefit from the drive for ever-greater military spending are the arms companies that stand to make a killing from it. This article originally appeared in Morning Star; it has been supplemented with breaking news material. Full-time reporter at Britain's only daily socialist newspaper, The Morning Star. Multimedia professional with a journalism NCTJ diploma from Press Association. Human rights activist and campaigner.